Here at Totalflorida we find the cheapest flights with the best service and wherever possible a direct flight. We also offer a pre advance service for all peak school holiday half term dates, which will allow you to get the cheapest prices as soon as the airlines release their availability. Flights to Florida in 2017/2018 are now very popular as it allows you to book early and save. Secure your Florida holiday now with a low deposit and pay off the balance by instalments. 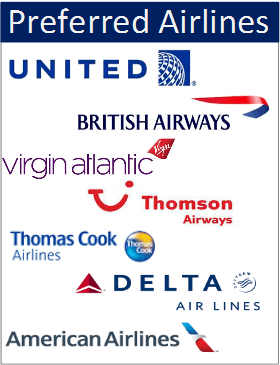 We use all the major airlines to Orlando - Virgin Atlantic , United Airlines, American Airlines ,Delta Airlines , and British Airways with new specials coming in every week!. Thomas cook or Thomsons are another of our favourites on the charter flights and where ever possible we will try and book you on the new streamliner. January 2018 Florida flights are cheap as long as you travel from the 9th onwards. February flights to Orlando in 2018 have a half term from the 14th and most people with children have to arrange their dates around this period so if you could try a few days either side that would help to save on cost. March flights to Florida in 2018 are cheap up until 22nd as this is then seen as early Easter with some of the private schools having their Easter breaks. April 2018 flights to Florida has its Easter time up until the 12th normally so anything past that date is at a good cost. May Florida 2018 flights are quite popular for the whole month, peak May though is from the 25th as its another of the school half term dates. June flights to Florida in 2018 are cheap up until 27th and from then on lots of the Manchester flights get busy with the Scottish holiday makers coming down to save a few pounds. July 2016 Florida flights is our second busiest period other than Easter but this 6 weeks period means that you can sometimes pick up a summer bargain. August flights to Florida in 2016 offer a cheap window for the schools – its from the 19th August to the 2nd September which is back just in time for school, but you must be quick!. September flights to Orlando in 2016 is another that can be quick busy on most dates, we have found though that the cheapest time is around the 11th as most parents do not want to take their children out of a new school term straight away. October 2016 Florida flights is a fantastic time to go, good weather smaller queues and around the 29th there is a half term that as long as you get your booking in early enough the availability is not too bad, plus you can get the scary Halloween horrors nights at universal. November flights to Florida in 2016 are as cheap as January, these 2 times to go are best suited for couples or those with small children as you can get the best prices. Then finally December 2016 Florida flights are only busy from the 18th as it takes in the half term plus Christmas and new year so if these are what you are after please book early on our pre advance service.